The only food magazine that I read regularly is the Middle Eastern issue of BBC Food. I have no idea if it is any different from any BBC Food issues. It's a monthly magazine and the only place I've seen it for sale in Dubai is the local organic food shop here. I love it for their great easy, fast and healthy everyday recipes, nothing too fancy nonetheless very delicious. 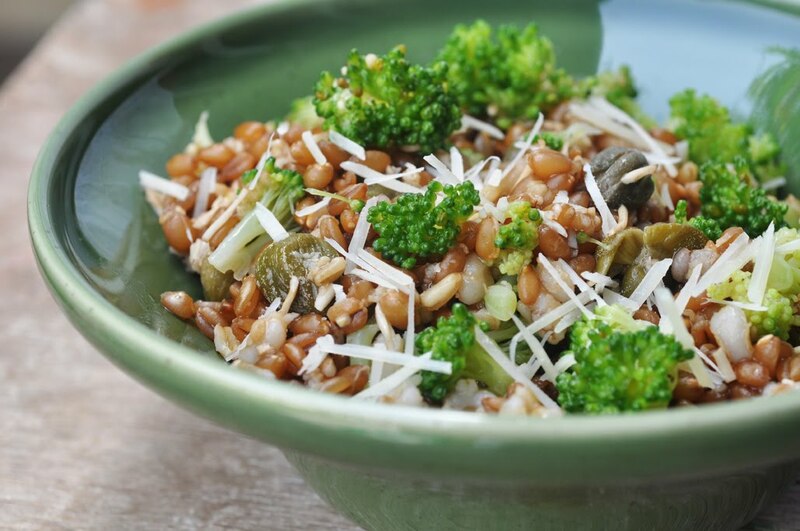 In the April issue they run a page with 10 simple lunch ideas, at least three were immediately shortlisted and this is one of them: Broccoli and Spelt Salad. I made it yesterday and took the pictures, put it on the fridge and took it out to have for lunch today. A day later it looked exactly the same, and was what was promised in the magazine: a light lunch, yet filling, and utterly tasty. Apart from that, great to prepare in advance the night before and take to work the next day. I used wheat berries instead of spelt, but I don't think this makes a big difference tastewise. Cook wheat berries in 3 cups of slightly salted water until soft and chewy, about 45 minutes, perhaps longer. Drain, rinse and let cool. Steam the broccoli florets for about 3-5 minutes. Put them immediately into ice cold water, to stop the cooking process. This way, they will retain their bright green color. Drain. In a little bowl, combine olive oil, vinegar and Parmesan cheese for the dressing. In big bowl, combine wheat berries, broccoli and capers. Pour over the dressing and mix gently. Sprinkle grated Parmesan on top to garnish. To be eaten cold or at room temperature.